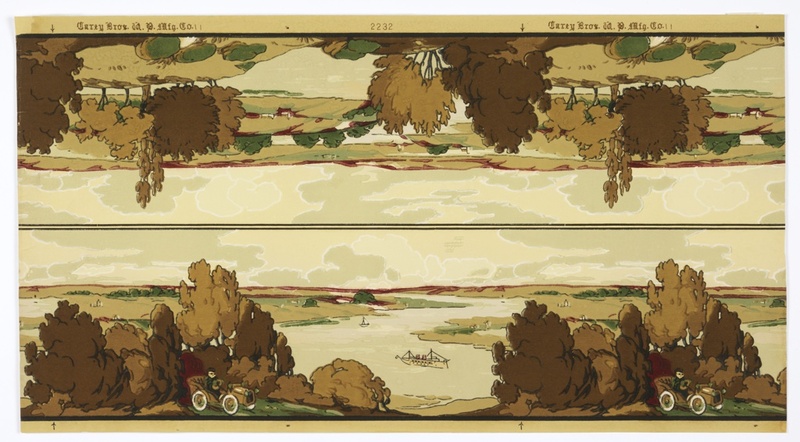 This wallpaper border shows two landscape scenes with the bottom one illustrating different forms of transportation including an automobile, a steam-powered boat, and a bi-plane faintly visible in the sky. While the design contains three modes of transport in use at the time this wallpaper was produced, it seems surprising that a train was not included. The paper is printed in a variety of natural colors, with tan, brown, and green predominant, with touches or red along the horizon. This border would most likely have been hung over a wallpaper printed in one of those colors. The machine-printing of wallpapers was well established by the end of the nineteenth century, with presses printing numerous colors in a single pass through the press. One of the major drawbacks of the machine-printed wallpaper was the small size of the pattern repeat, which typically measures about 18 inches. There were many consumer complaints about the monotony of the small repeats but some manufacturers found ways to get around that. This wallpaper border contains two different landscape scenes printed across the width of the paper, each with a repeat of twenty-two inches. These two scenes actually compose a single border design, as the paper would be cut horizontally down the center line, then again at the arrows printed in the selvedge. The brown tree, appearing just above the arrow, shows up in both landscape scenes and joins the two together. Alternating the two different scenes would increase the pattern repeat to forty-four inches. The Carey Brothers Wall Paper Company was rather short-lived but they did create a nice range of mid-priced wallpapers. They began printing wallpaper around 1880, incorporated in 1905, then dissolved in 1918.